The Microsoft Xbox 360 was the first of the next generation of gaming consoles, a full year ahead of the Sony PS3 and the Nintendo Wii. With its first-mover advantage, the Xbox has established itself as a top-tier game console, and according to vgchartz.com—a website that tracks console sales—11.83 million Xbox 360 consoles have been sold since its launch in November 2005 (the Nintendo Wii tops the chart with 12.42 million units, and the PS3 is a distant third with 5.07 million units sold). For its follow-up act, Microsoft has released the Rs34,990 Xbox Elite with a capricious 120 GB hard drive (six times bigger than the previous 360’s, double the PS3’s), an HDMI (high-definition multimedia interface) output for easier hook-ups to HDTVs, all clad in a purposeful-looking matte-black finish. So, is the Elite worth paying that extra Rs8,000 over the Xbox Premium? Well, the Elite does not have any groundbreaking new features and may not make sense for an existing Xbox 360 user who can opt for the snap-on hard drive. Disappointingly, the Elite’s higher price tag doesn’t deliver the anticipated upgraded features. Strangely, no wireless networking—even my son’s Nintendo DS with its 12-year-old computing technology supports Wi-Fi, an inexpensive, widely used networking standard. Further, there is no HD-DVD bundled in—something which Microsoft could have used to drum up some excitement for the Elite. For HD-DVD support, one will have to buy it as an optional add-on. However, with a large and impressive line-up of games, the Xbox Elite remains a better option for the first time buyer till the time the PS3 can offer a wider and more compelling selection of games as most people purchase a platform with very little research other than selecting which system supports the games they want to play. The 120 GB hard drive will be a huge benefit if you plan to use the Xbox for lots of movie and music downloads. The unit also now has an HDMI 1.2 interface, the optimal interconnect for high-definition video playback at up to 1,080p (progressive scan) resolution. The system comes with a matching black wireless controller rated to a 30ft range. Also included: a HDMI AV cable; the Component HD AV cable with component, S-Video, and composite audio inputs; an audio adaptor for composite audio and optical audio inputs; a headset; and an ethernet cable. The Xbox Elite is available only through www.indiatimes.com. Last week, it took me about 11 glorious hours to save Earth, and it was a fight to the finish. As Master Chief, the hero of Halo 3 for the Xbox, I fought the Brutes with a variety of firearms, in hand-to-hand combat, on ground and in the air, rescued Cortana from the Gravemind—Halo 3 is indeed the game I have been waiting for the past three years. Admittedly I played in the single-player ‘Easy’ mode, but now I am spoiling for a fresh firefight in the more difficult ‘Heroic’ gameplay mode. Events play out like a spectacular sci-fi action blockbuster, and the nine levels in Halo 3 have spectacular pacing that weaves from close-quarters, intense battles with Chief and a few soldiers, to more larger arenas. This is a gorgeous game that has quick pace, and takes off from Halo 2, when we left Master Chief heading towards Earth to thwart the Prophet of Truth and his army of Brutes from destroying the universe by activating the Halos, The Arbiter and his Elites, once bitter enemies of humankind who have made an uneasy truce in order to conquer a greater evil and rescue Cortana from the Gravemind. I will spare you the spoilers because the game is so compelling and should be experienced first-hand. Halo 3 is a satisfying book-end for the trilogy and yet leaves you thirsting for more adventures set in the Halo franchise. The previous Halo iterations allowed two players to play the campaign; with Halo 3, up to four players can play in the co-op mode and online over Xbox Live, if you wish to do so. And hey, if your triggermen are as good as mine, it is a lot of fun and competitive to boot to see who racks up the most points. In addition, you can also play competitive solo and team-based multiplayer matches with up to 16 players on 11 different maps. The Halo franchise has had a strong artistic legacy married to technically impressive graphics. The game maintains a smooth frame rate throughout, with plenty of great lighting and other effects in a wide range of locales including deserts, snow, jungle settings, great-looking building interiors and more. There is some great new music along with the familiar Halo theme music and hilarious combat dialogue. I have yet to fully utilize the features such as the Forge utility through which you can spawn, remove and move objects and items around a level in real time. You can easily share your Forge creations with other players via a handy file-sharing system that lets you quickly send map configurations and gameplay types to your friends online or browse the developer website at bungie.net to share and rate the items. Every time you play Halo 3, the 3D game data from your match is saved to your hard drive or memory card. Let us say you are in the turret of a wildly swerving Warthog and manage to somehow blast the sucker who is decimating your marines from high up the mountainside. Now you have footage of this insane headshot and instant bragging rights. You can go back to that match, pause just as you fire, detach the camera from your character, and pan around the scene following the tracer trail of the bullets right through your victim’s skull. This can be recorded and uploaded to anyone else who has a copy of Halo 3, or simply replayed to gloat. Now please excuse me while I go and save the world, again. 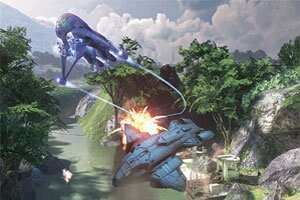 Halo 3 Limited Edition costs Rs2,510, including exclusive art and videos.